Previously, Leaders Hot Seat Part 1 and Part 2. The Leaders division was rather tame this year with so many new/recently new coaches. But things are a little more unsettled in the Legends. We've been getting a lot of questions about Kirk Ferentz's buyout ever since the nation's sixth highest paid coach went 4-8, lost to Central Michigan, hired a guy to coordinate the nation's 114th ranked scoring offense, and finished last in the Legends Division of the worst Big Ten in a generation. 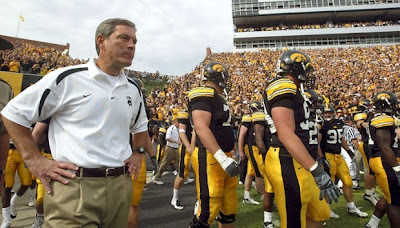 In simple math, Kirk Ferentz has a contract through January 31, 2020, that pays him between $1.87M and $2.07M per season in base salary, plus another $1.48M per season in "recurring supplemental payments" which is just a fancy way of saying that Gary Barta has to pay him $370,000 four times a year on top of his salary. The buyout clause in Kirk Ferentz's contract mandates that Gary Barta pay him 75% of his base salary if he is terminated without cause. That works out to $18,846,249 as of this week, or $219,142 per month until the contract ends in January 2020. After a very successful 11-2 season in 2009, Iowa has struggled to remain at the level they're used to playing at. An 8-5 record in 2010 and 7-6 in 2011 is really turning up the heat on the Big Ten's most tenured coach. Last season alone should be enough to elevate Kirk into the orange, but yet another loss to rival Iowa State, as well as Central Michigan and 6 losses in the Big Ten and you've really got to wonder just how much more the old ball coach has left in the tank. When you return 6 offensive and 8 defensive starters from a team that won 4 games, that could be considered a negative. And it's not like Iowa has a ton of incoming top-tier talent either. Recruiting rankings since the 2010 class according to Scout dot com: 2010: 45, 2011: 25, 2012: 47, 2013: 51. Not exactly tearing it up on the recruiting trail, at least not what you'd expect from a coach paid as well as Ferentz. The 2013 schedule starts out with a laughable non-conference slate, as usual. They do get 5 B1G games at Kinnick, which could help. But road trips to Columbus and Lincoln are most certainly pegged as losses. Needless to say, Kirk Ferentz is not going to be fired, because even if it is warranted (and I'm not starting that conversation here), it's completely beyond our budget. 2012 could've gone better for Michigan. Playing one of, if not the toughest schedule in college football took its toll on the Wolverines last year. Their five losses were to teams that finished with a combined record of 56-7, including both teams that played for the BCS national title, one that played for the Big Ten title, and another that finished the season 12-0...all on the road. The offense sputtered under Denard Robinson at quarterback. While he was certainly a prolific play-maker, his ability as a pure passer left much to be desired. When he went down with a nerve injury against Nebraska, former backup QB turned wide-receiver Devin Gardner stepped in and helped rejuvenate the Michigan offense in the last 4 games of the regular season. He also gave Michigan fans a glimpse of what the offense will look like once he's the full-time starter beginning this season. Along with Denard Robinson leaving, Michigan losses quite a few starters going into 2013, especially along the offensive line. The interior of the line must be rebuilt, but having both tackles, Taylor Lewan and Michael Schofield back does help considerably. DT Will Campbell, LB Kenny Demens, SS Jordan Kovacs and WR Roy Roundtree will also be missed. 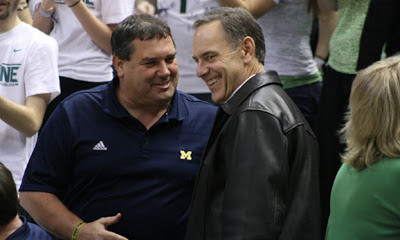 But the positive impacts of all of the success Hoke has had in the recruiting effort should start to pay off quickly in many of those positions. Injured backup QB Russell Bellomy will miss most if not all of the 2013 season with a torn ACL, putting pressure on incoming freshman Shane Morris, and also increasing the likelihood of a possible incoming transfer to add depth to that position. Standout SLB Jake Ryan also tore his ACL in spring practice, but might be able to return by mid-October according to Hoke. The schedule lightens up a bit from the gauntlet of 2012. It helps to not play Alabama. Michigan gets Notre Dame, Nebraska and Ohio State all at home. But road contests at Penn State, Michigan State and Northwestern will be tough. 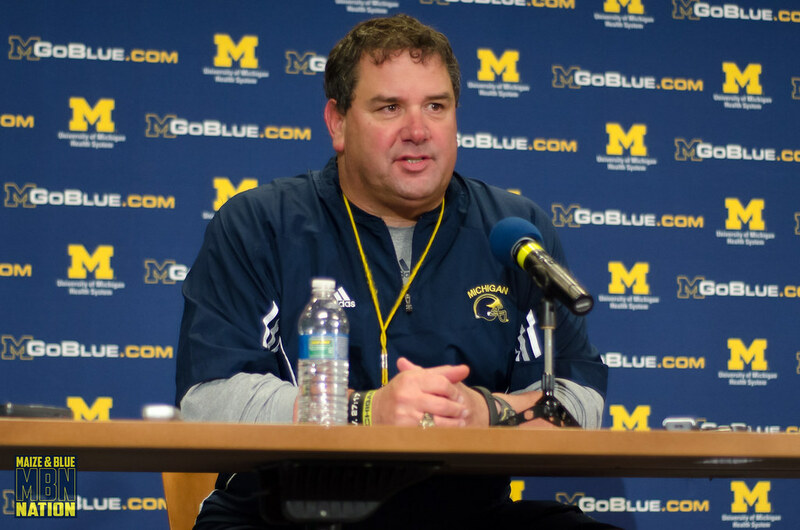 While 2011 was a special season for Michigan, 2012 was a dose of reality that made Michigan realize that it still has a little ways to go before they are the dominant program that Hoke wants them to be. But they're getting there. And if recruiting alone is any indication, the future is very bright in Ann Arbor. I stand by that. Mark, despite struggling in 2012, is still the right man for the job in East Lansing. As long as he continues to hate Michigan, he'll remain in good graces among Sparty fans. But he must deliver victories. His 4 year streak was snapped last year by the foot of Brendan Gibbons in a classic defensive battle. Time will tell, though there seems to be a clear separation in recruiting between Michigan and Michigan State, we'll see if that trend continues on the football field. And that's really the key for Dantonio. He must start recruiting better. He can't offer prospects and then get turned down so they can pursue their almost non-existent rap careers. It's terribly embarrassing for the program. And with joining the future east division of the Big Ten conference starting next year, it's going to be imperative for Sparty to stay relevant with the upper crust of the league. Over the last few years, it's never been an easier time for Michigan State to shine, and they did, albeit not that much. With Michigan being down, Michigan State won 4 in a row, but failed to walk away with an uncontested Big Ten title, or at least a BCS bowl berth, which would've been huge for a program like Sparty's. But Mark Dantonio has flourished in East Lansing. And to continue to do so, he's going to need to not only beat Michigan, but rack up wins with the rest of the league. That's about to get a lot tougher. They bring back most of the offense, 9 starters, but do lose some key contributors on defense, namely CB Johnny Adams and DE William Gholston. But the state of Sparty's defense is still very strong, and will be a big part of any resurgence effort. Most did not expect starting RB LeVeon Bell to leave early for the NFL. He and TE Dion Sims, two of the best players on offense a year ago, are going to be tough to replace quickly. Legends Part 2 will be coming at you shortly.